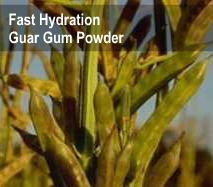 The natural fast hydrating, dispersible and diesel slurriable guar gum is ideally suitable for all rheological requirements of oil well drilling, continuous fracturing and diesel slurry. It is widely used in oil well drilling due to its multi-function such as fluid and water loss control, viscosity control, lubrication. It is used for cooling of drill bits, mud drilling and cementing slurries, where immediate high viscosity and quick hydration is required.The main use of guar gum is in top hole oil well drilling. Industrial grade guar gum powder is suitable for use in oil well fracturing, oil well stimulation, mud drilling and serves as a stabilizer, thickener and suspending agent. In oil well drilling guar gum used as a surfactant, fracturing fluid and synthetic polymer for all requirements of water based and brine based oil well drills. It attains high viscosity in 3 to 5 minutes of time.